From September 2014 to August 2015, my husband and I made San Antonio our "temporary" home. One month ago, we left Texas and moved back to our home in Southern New Mexico. Despite the circumstances for going to Texas, we made the best of it and enjoyed some delectable food. 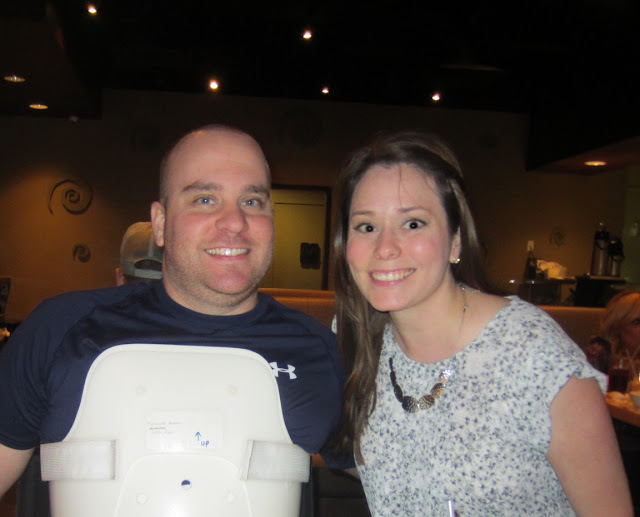 For those of you who don't know, my husband is in a wheelchair, so if we are going to a new place/restaurant, we have to plan before heading out. It's not that big of a deal because most restaurants are accessible, but I made a habit of calling ahead to ask about accessibility and parking. 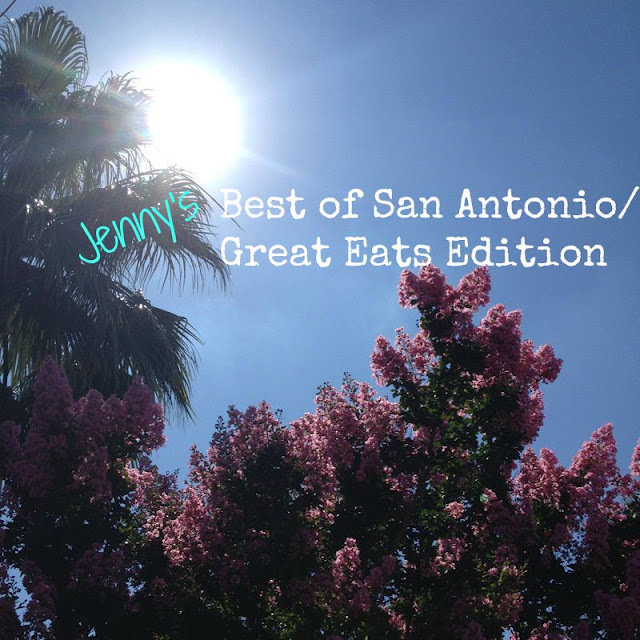 Without further ado, here's my list of great eats in San Antonio, Texas! Dough - Tucked away in a strip mall, you'll find Dough. It was featured on the Food Network so we looked up the address and checked it out. We thoroughly enjoyed the fresh mozzarella cheese plate and "pork love" pizza. Duck/Foie Gras and absolutely loved it. Boiler House Texas Grill & Wine Garden - Tapas, beer and wine. What more could you ask for? We went here multiple times during our time in San Antonio, including on Valentines Day with our great friends. Valentine's Day dinner with great friends. Sushi Zushi -- We went to the Colonnade location and the "Colonnade Roll" was our favorite. We went here for our anniversary and many times for lunch and dinner ,as well as happy hour. It has various locations around San Antonio. My eyes look demonic, but that's what I get for having big eyes. Lick - Wonderful, delectable ice cream in flavors you'd never think of putting together. I enjoyed the goat cheese and thyme ice cream. Amy's Ice Creams - My friend Melanie and I went here for an afternoon treat before getting mani/pedi's. They had a chalk board with drawings of the worker's favorite concoctions. We noticed there was one called "The Turtle" and we both ordered it-- chocolate, carmel and nuts. SO YUMMY!! County Line BBQ - Top-notch BBQ joint. 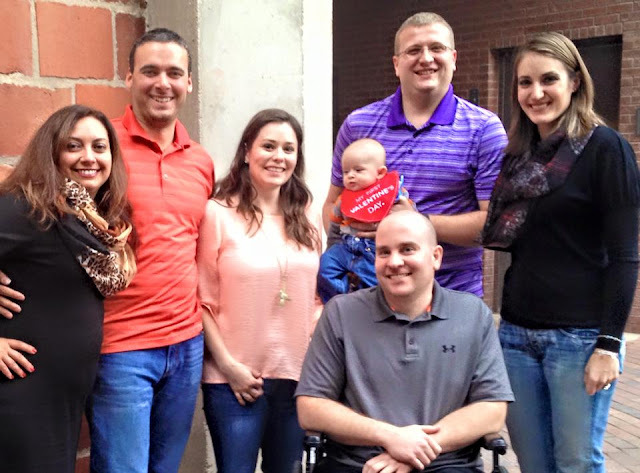 We hosted my sister's 30th birthday at the Austin location last summer. Torchy's Tacos - "Damn good" is their motto and it's on point! We also ordered a side of corn salad and it was AH-MAZING. DOn't expect to get in and get out really quick. This place was packed with a line out the door when we went for lunch. Apparently we were blocking the exit when we came in together. It's a safety issue for the servers, so the manager immediately came over to us and asked us to follow him. He had a table for two set up next to the bar and the bartender took our order. We left bad, but then we didn't because we were starving. It's obvious this chain is all about it's customers and we were two of the happiest customers that day. Papadeaux - This is a chain restaurant, but it is a must when you visit San Antonio! They have amazing seafood. We went here with our friends who visited from Dallas, introduced it to my sister and brother-in-law and we took our friends Melanie and Nick, who are from Louisiana. They all LOVED it! I can't wait to go back when we visit Texas next summer. 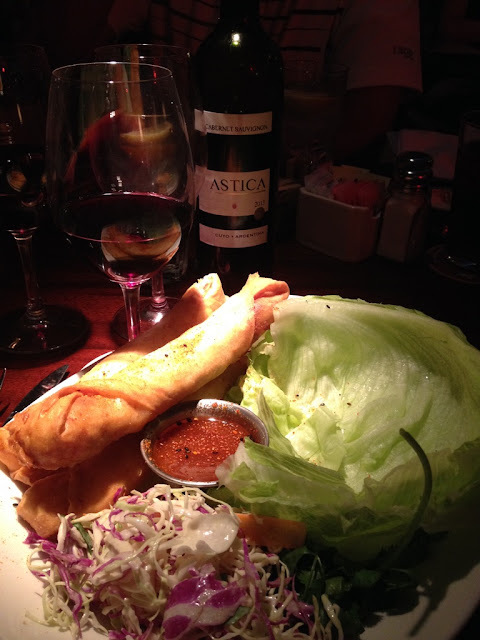 lobster spring rolls with lettuce, slaw and dipping sauce. So delectable! I really hope you enjoyed this Great Eats Edition. I enjoy writing these editions and sharing the photos. It's a way for me to travel down memory lane and share my life with you! The next time you're in San Antonio, I'd love for your to visit one of these places and let me know your thoughts on the food! Thanks for stopping by JennyPennyAho and stay tuned for Jenny's Best of San Antonio/Great Attractions Edition!